The image above is from the latest and greatest European Forecast Model (that is circulating on social media this morning) showing the potential for very heavy snow to fall during the pre-dawn hours on Thursday. Heavy, wet snow is likely across the Washington Region between 3 and 7AM Thursday with intermittent snow showers or squalls continuing through Thursday afternoon. The European and Canadian forecast models continue to feature colder temperature profiles when compared to the GFS (Global Forecast System) and NAM (North American Model). 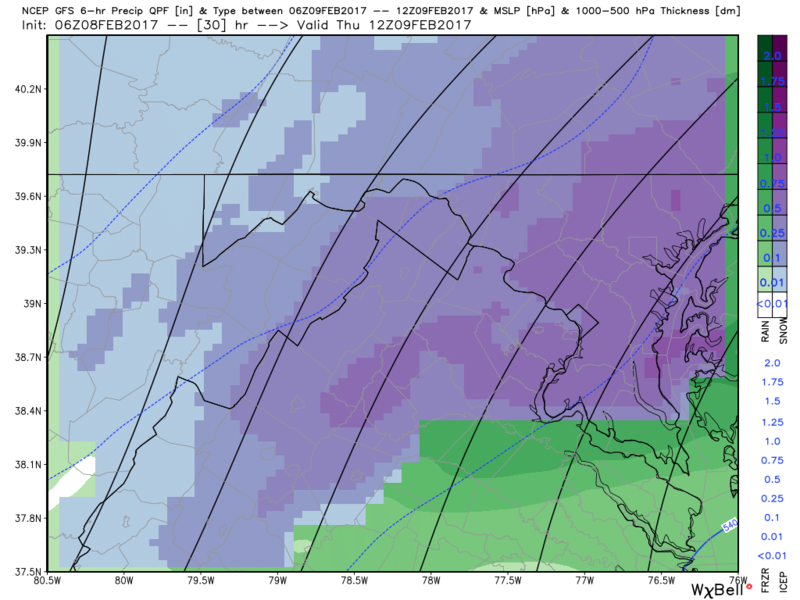 After looking at the latest European model I feel strongly that the Washington Area is in for a period of heavy wet snow with snowfall rates likely approaching 2″ per hour during the pre-dawn hours. 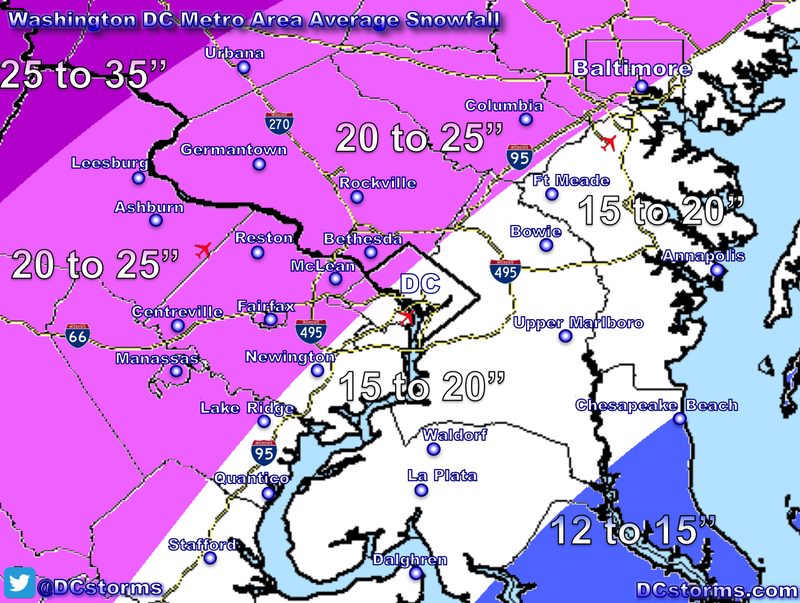 I believe that strong dynamical cooling will be a player in snow eventually beginning to accumulate on untreated roadways north and west of the “ridiculous” urban heat island of DCA (National Airport is a ridiculous and laughable location for measuring our Nation’s Capital’s official weather data). I stand with Eleanor Holmes Norton who calls for it to be moved to somewhere in the District of Columbia (preferably away from the Potomac river). Based on latest North American Model (NAM), Euro and Canadian models I am not changing my snowfall map. 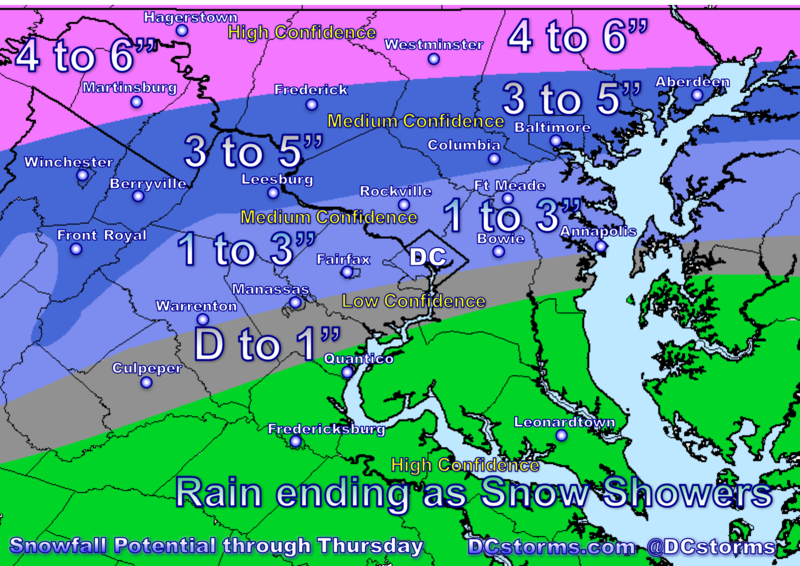 I will adjust amounts if there are significant changes this afternoon. For those of you who live in the urban jungles of South Arlington, downtown DC (away from Rock Creek Parkway) you will likely see at most one inch of slush due to the warm antecedent conditions with wet roadways. 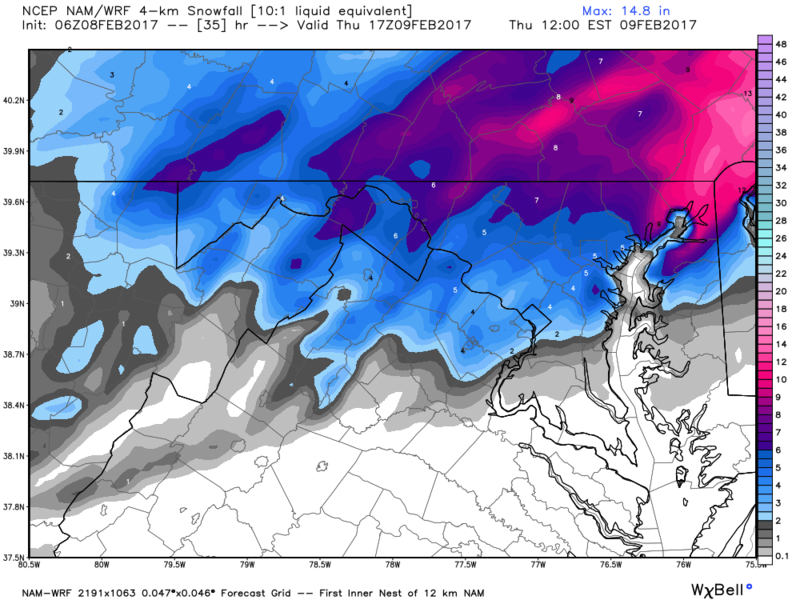 But for the rest of the millions of people who live north and west of the Capital Beltway… I still believe that our traditional northern and western suburbs still have the potential for snow to accumulate on grassy surfaces, cars, and even untreated secondary roadways the further north and west you go. 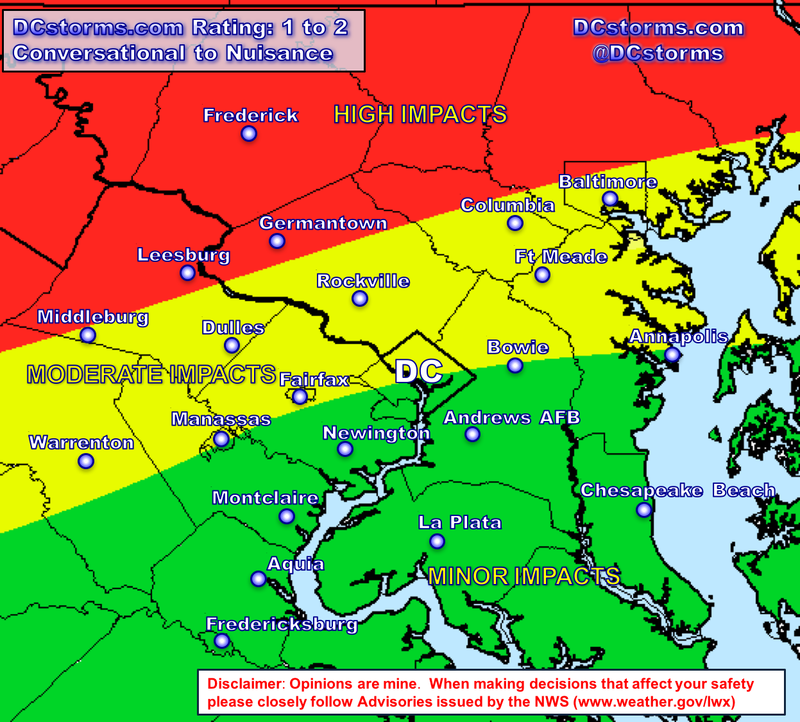 Impacts: This storm will be a Conversational Event (rating of 1) for the southern half of the DC Region to a Nuisance Event (rating of 2) for the northern half of the region. High impacts – slushy snow may accumulate on untreated roadways with slick travel conditions in the higher elevations of the area in red as temperatures drop into the upper 20s to near 32 degrees by 7AM Thursday. Medium impacts – some secondary roadways away from the local urban heat islands (Arlington, Downtown DC, etc.) may become slush-covered. 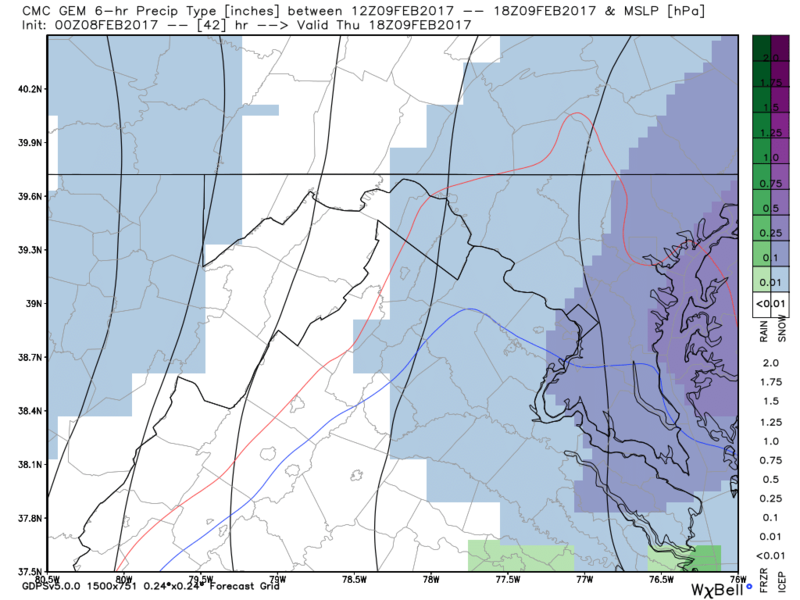 Minor impacts – unless this storm really slows down or over-performs, you folks will likely see wet roads with mainly a rain event changing over to a period of snow. Red line on first image below is from latest Euro model showing the freezing line at the surface at 7AM (12Z) Thursday morning. 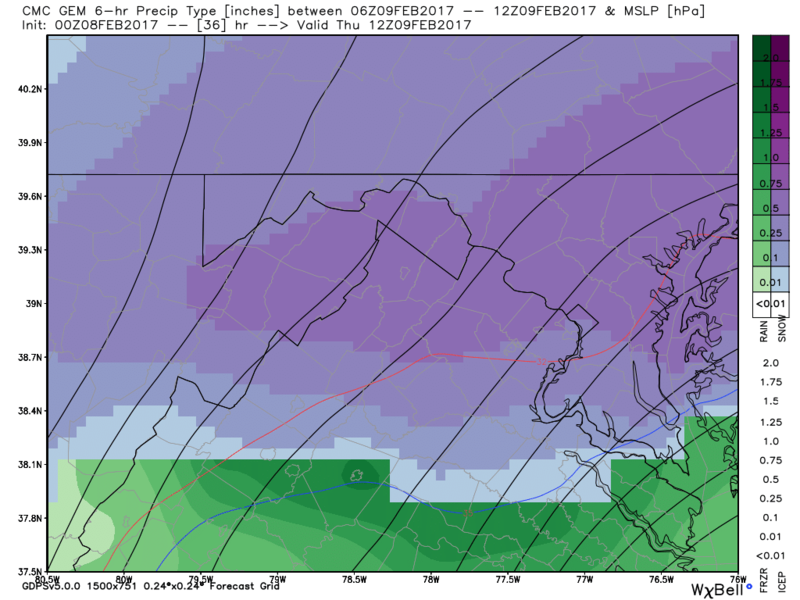 Notice how bullish the European is on precipitation amounts with one half to three-quarters of an inch of liquid (if we melt down the snow). If it were below freezing with a cold ground prior to this system we’d be looking at 5 to 7 inches of snow with 1:10 ratios! Of course some of this is going to melt on contact but locations well north and west of Washington may now understand why you are currently under Winter Storm Watches. Scattered snow showers and squalls are possible until we lose the heating of the sun. 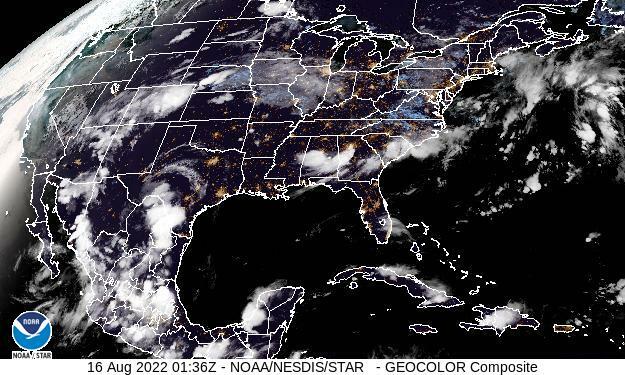 Very similar to the European forecast model so I’m not going to go into details. 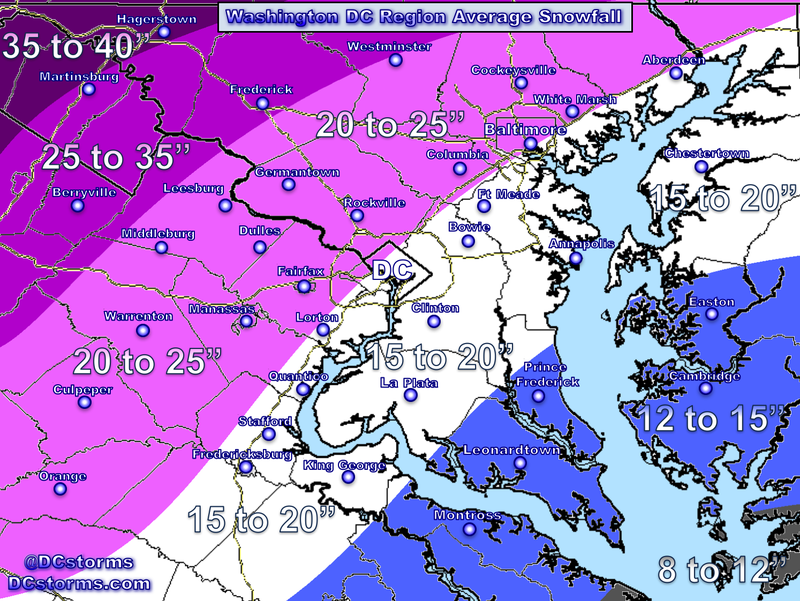 Images show the same time frames that were shown in the Euro (12z/7am Thursday), (18z/1pm Thursday) and then it’s latest snowfall accumulation map (images courtesy WxBell). 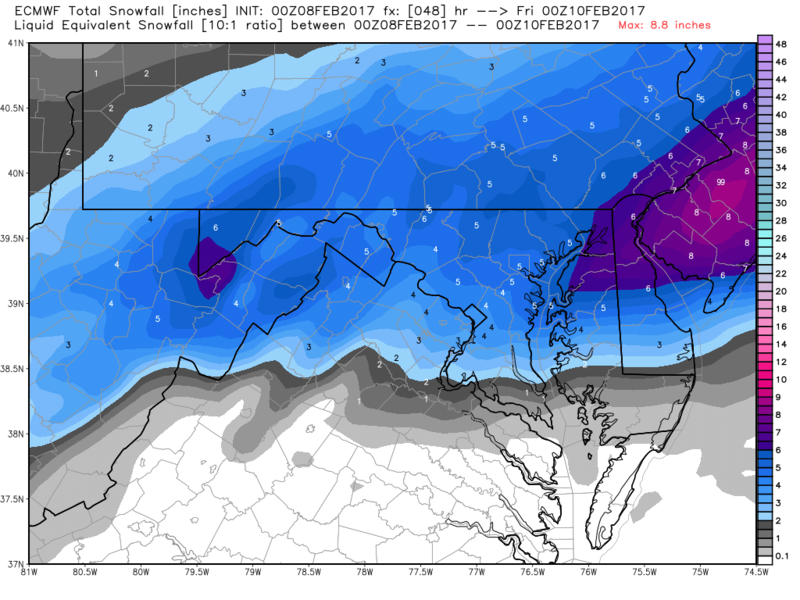 This model continues to show a track (image courtesy TropicalTidbits) closest to the coast and is currently an outlier if you compare it to the Euro, Canadian, and GFS track, however it’s latest snowfall accumulation map (image courtesy WxBell) still shows some impressive snowfall totals especially across northern Maryland! 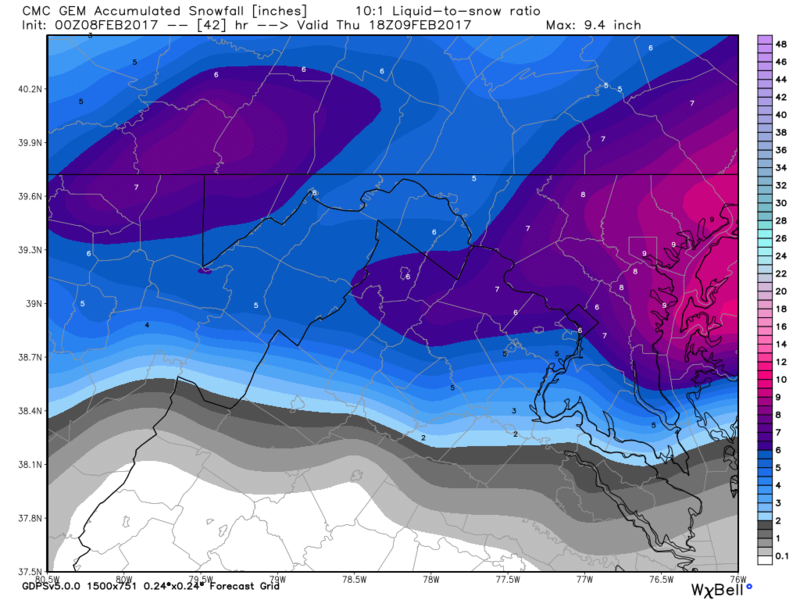 If you hate accumulating snow but wouldn’t mind seeing it fall… this is your model! Can we throw this model out completely? 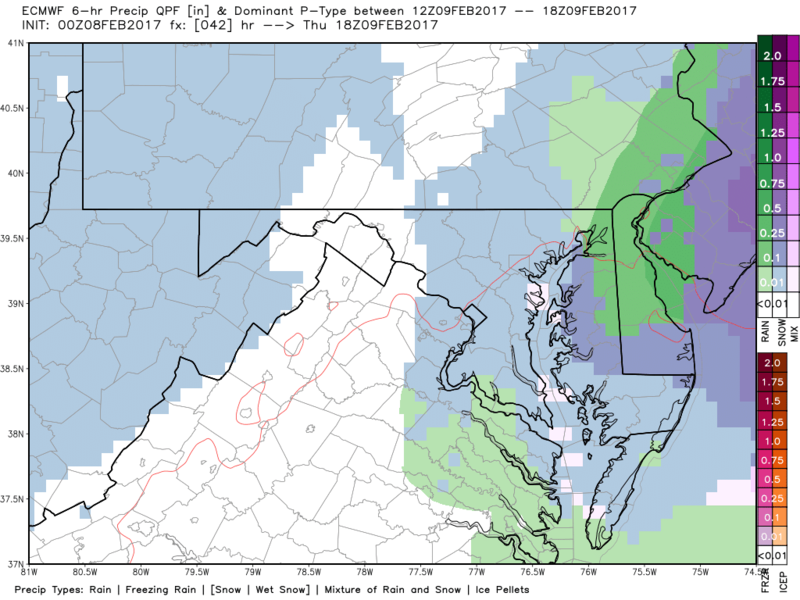 It’s track and precipitation amounts have been consistent but I’m slightly perplexed by its snowfall output mainly because it shows no snow accumulation except for “winter weather advisory (under 4”) across northeastern Maryland“. I’d like to see the European model drop it’s accumulations way down in its 12z run (will come out this afternoon) before I buy in 100% to the GFS solution at this time. I’ll look at the latest models this afternoon and will issue a final snow map if necessary. 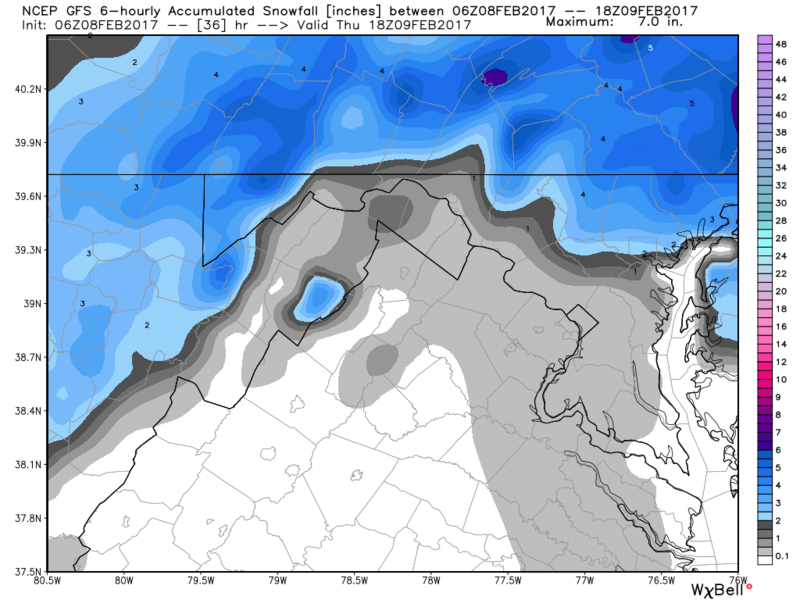 I believe 5″ is likely (4 to 6″) along the MD/PA border and across the higher elevations of the northern Shenandoah and Potomac Highlands. 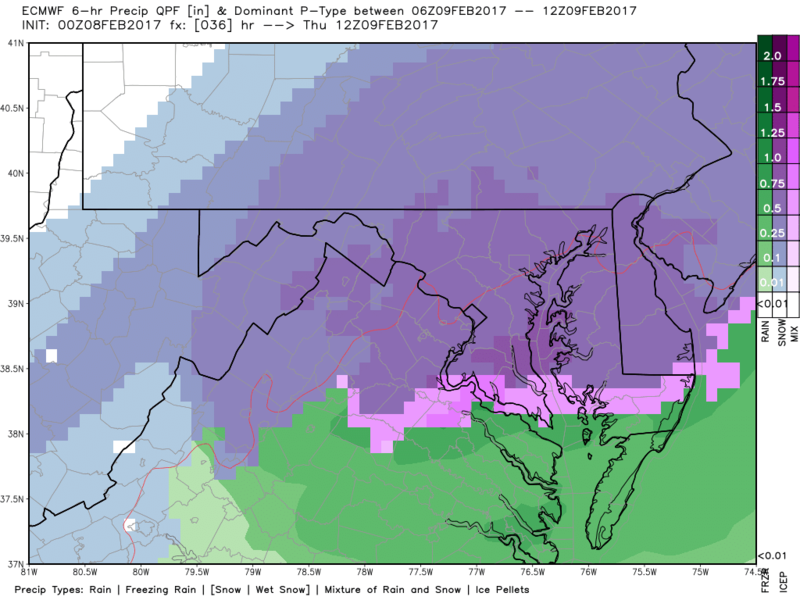 1 to 3″ of snow looks reasonable in the northern and western suburbs of the immediate Metro Area (Rockville, Reston, Bowie). 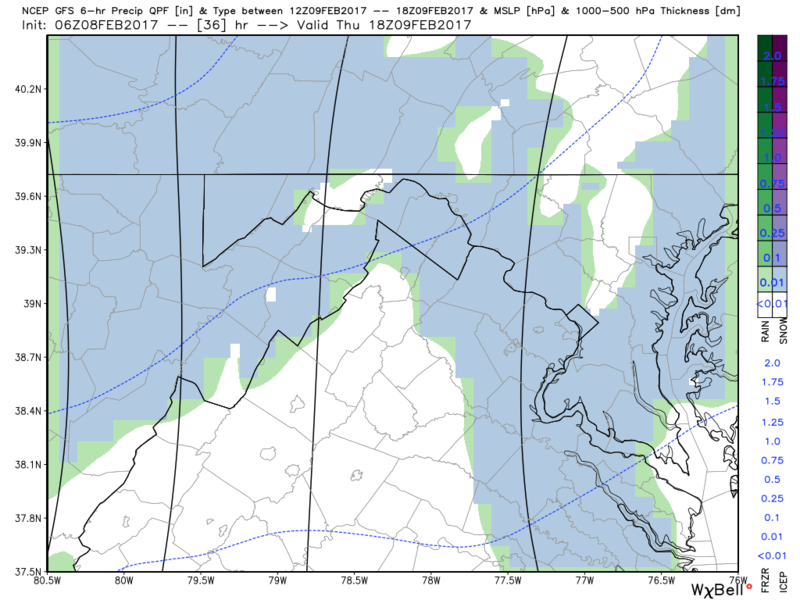 Finally those of you in downtown DC, south Arlington (living around DCA airport) … a dusting to one inch is possible on grassy surfaces.